One more short TBI post before moving on. The FDA has approved the first handheld device to detect bleeding in the brain. 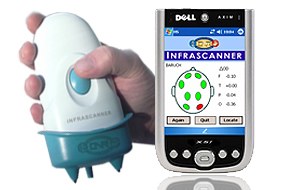 Marketed by InfraScan, Inc, of Philadelphia, the Infrascanner™ is a mobile medical imaging system for detecting hematomas, or swelling of clotted blood, in the brain. The noninvasive device uses near-infrared (NIR) optical tomography and displays images on a normal portable digital assistant (PDA). Research on the unit was initiated and funded by the Office of Naval Research (ONR). Read the ONR press release, "Naval Technology Could be a Lifesaver." This news also led us to explore a couple TBI resources, BrainLine.org and the VA Polytrauma System of Care, both new to us and full of reliable information.